Kona Kai Resort offers a variety of flexible indoor and outdoor space to best accommodate your event. Whether an intimate wedding or a party fit for a king, we have the versatility to that best suits your needs. Perhaps it’s a meeting of top executives or a sales team celebratory party, our professional event services staff will work with you to design and accommodate exactly the event you want. 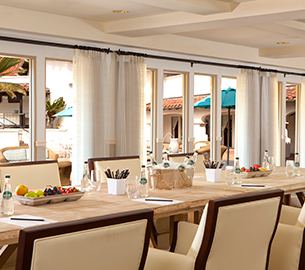 For larger events, consider utilizing our ballroom, which features natural light and breathtaking marina views. For smaller groups, the resort offers several meeting rooms with a central courtyard directly outside, or private dining options as well. Marina tenants are eligible for preferred pricing on all catered functions. You plan the agenda, we’ll create the magnificence. We don’t mean to be distracting, but the views from Kona Kai Resort are kind of something. The magnificence of San Diego Bay creates the perfect backdrop for a formal conference, general meeting, or intimate breakout. Whether a large meeting or small retreat, Kona Kai Resort offers 13,000 sq. ft. of indoor space accommodating up to 500 guests comfortably, and 43,000 sq. ft. of outdoor venues, including a courtyards, gardens and a private beach. Relax, knowing our event services team will do absolutely everything to personalize your event. Breathe in the salty breeze, as the quiet waters of the bay ripple at your feet. 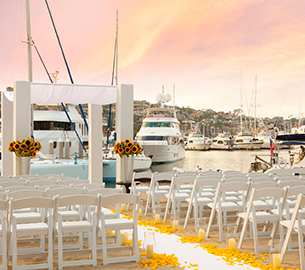 Today is your day, set on a private beach or a tropical garden against the backdrop of the San Diego Bay. Views abound from all our outdoor spaces including courtyards, terraces, gardens, and the private beach. Whether is relaxed romance or casual luxury, we’ll help create the perfect gathering of an intimate group or a collection of friends and family. Large or small, our expert planners will help create the magical wedding of your dreams.